Over the course of the year, every child in the class has a chance to take the Prayer Bag home to share with their family. Inside, children will find items to allow them to set up their own focal point in an area of their home that will allow for special prayer time, on their own or with their family. 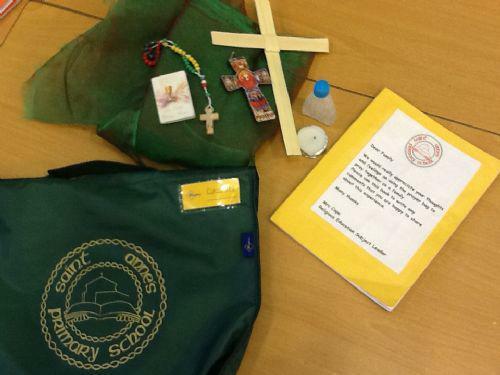 Children are encouraged to light a candle as a sign of Jesus' presence and to bless themselves with the Holy Water. As part of their experience, we encourage children (with the support of an adult) to complete the diary. Children could either write a recount of how they set up the focal point or they may wish to write a special prayer intention. We would also really love to see as many photographs included in the diary as possible so children can share their experiences with their peers.